In the newly updated Indie Games section of Google Play, I stumbled upon Grabatron. I’ve seen it a few times now, but seemed to always pass it by. I decided to check it out and was happily surprised. In the beginning, you take control of an alien spaceship equipped with a huge retractable claw. You can pick up cars, cows, humans, rocks, or anything else you can fit. 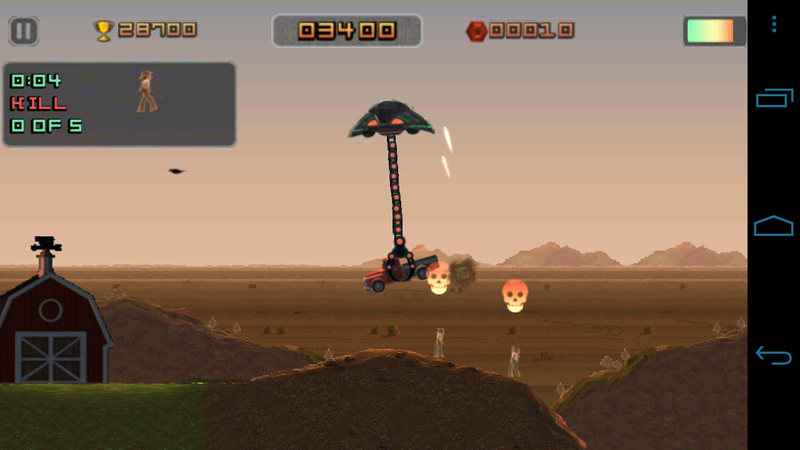 Once the objects are picked up, you can fling them hundreds of feet to their death or even abduct them for points. It’s a blast. As you scroll through the environment, the game gets much harder. Not long after the beginning of your invasion, the military is on to you. It’s a constant fight for survival and search for lost alien friends. So far, I’ve had a ton of fun playing and for free, it’s most certainly worthy of your time. Check it out and let us know what you think.